TAKEN 1999 on FUJICHROME slide film.CONVERTED TO TIFFS, THEN CHANGED TO JPEGS. no idea of camera or lens used, but was on a tripod. 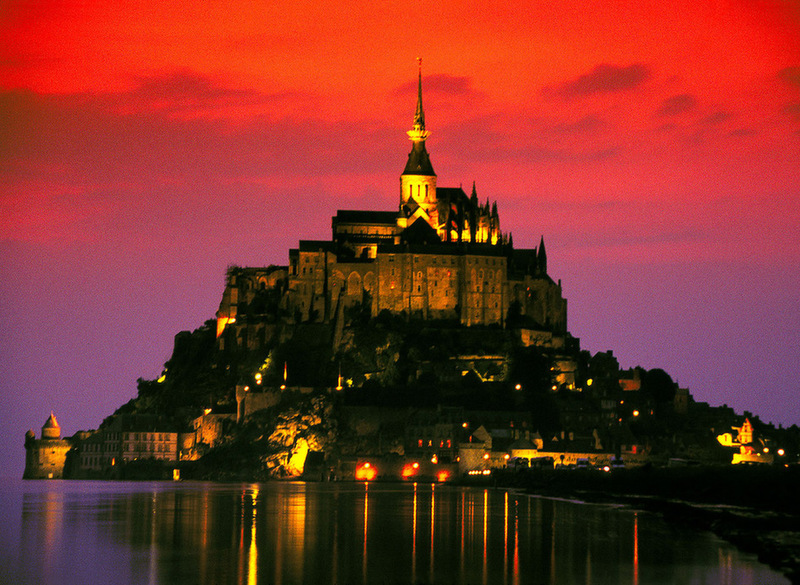 Lovely sunset colour, Jim, and a very nice night view of this iconic Normandy island and medieval monastery. Oh the good old days of film, and waiting to see what you'd got! Terrific color and shapes, Jim. Wonderful how you can revive this oldie. Looks sort of inviting and maybe a little scary. I find it fascinating how the time of year and/or cloud conditions can change things so much. I was there on Dec 26 at sunset, and the red skies were in the opposite direction. I'm guessing you took this in summer, though, with the sun setting in a very different position.